Before obtaining a motorcycle license in Tennessee, riders must first learn all the motorcycle laws and rules of the road in order to pass a written exam. Following the written exam riders must also pass a skills/road test. Once these tests are passed drivers are free to cruise throughout the state. In fact, there are more than 168,400 motorcycle registered in Tennessee. Although most riders and motor vehicle drivers enjoy the ability to renew their license without the need to retake a test, laws change and many drivers are not aware of changes until it is too late. There were more than 3,300 motorcycle accidents reported in 2012 which resulted in hundreds being injured and dozens suffering fatal injuries. The majority of collisions in the state occurred on weekends. The two top causes of motorcycle collisions were speeding and driving under the influence. Motorcycle accidents can be very dangerous and the majority of the times the motorcyclist suffers from life-threatening injuries. If you or a loved one has been injured in a motorcycle accident, the victim may be entitled to compensation for property damage, medical expenses, lost wages, and more. Our motorcycle crash law firm can help you fight for your rights. Fill out the FREE CASE REVIEW form to your right for a no-cost, no-obligation review of your motorcycle accident claim your information will remain completely confidential. One of the most important laws that each state sets forth is the motorcycle helmet law. Throughout the United States only 20 states have adapted a universal helmet law. A universal helmet law requires that all motorcycle riders, no matter their age or driving experience, wear a helmet while on a motorcycle. Tennessee adapted a universal helmet law in 1967 and it estimated that since then 46 per 100,000 resident lives have been saved. Furthermore the Centers for Disease Control estimate that the state has saved more than $94 million in economic costs. Several surrounding states have also adopted a universal helmet law including Mississippi and Alabama. Although the law requires the motorcycle riders wear a helmet less they get fined, according to the Tennessee Department of Transportation of the accidents in 2008 of 148 fatal accidents, approximately 9 riders were not wearing motorcycle helmets. Wearing a motorcycle helmet can save lives and according to the Centers for Disease Control in 2010 more than 1,500 lives were saved due to helmet use. No matter if a rider was wearing a motorcycle helmet or not, being injured in a motorcycle accident due to no-fault of your own can be a difficult situation to handle. 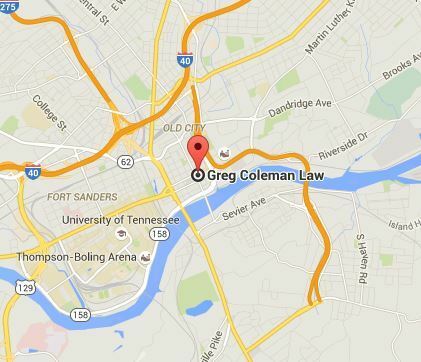 If you or a loved one has been injured in a Tennessee motorcycle accident and the victim is seeking comprehensive legal counsel, the lawyers at Greg Coleman Law are ready to help. With more than 40 years of combined legal experience, our attorneys are well-versed in Tennessee laws and can help you determine what your legal rights are. We are committed to helping accident injury victims fight for their right for fair and just compensation. and many more local towns and cities. To find out how we may be able to help you with your motorcycle accident claim, contact us at (865) 247-0080 to schedule a FREE, no-obligation initial case consultation. If you would prefer to contact us online, fill out the FREE CASE REVIEW form to at the top right-hand corner of this page its FREE to submit and completely confidential.